In addition to creating an inviting place for your family and friends to relax in their patio chairs by the warmth of the fire, an outdoor fireplace can create a very nice focal point in your backyard landscape. Because of the wide variety of materials and styles available, there is sure to be one that will look perfect next to your home. Unlike a simple fire pit, an outdoor fireplace allows you to have more control over the fire. Most designs include a chimney or flu, which can redirect the smoke and add more air into the fire. Because the fireplace provides more control, you also have the flexibility to extinguish the flames as quickly as possible. 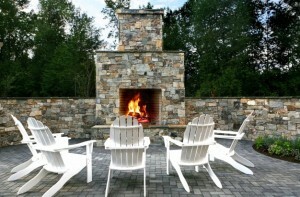 Maintenance with an outdoor fireplace is also easy; with simple cleaning an occasional painting, the centerpiece to your backyard can look good-as-new for years to come. A gas-burning outdoor fireplace is extremely easy to turn on and off and are free from smoke and sparks. The main disadvantage is that you’ll likely need to dig up your landscaping, as gas lines need to be brought to the location. If you’re in the middle of re-landscaping, now is a great time to install one! A wood-burning outdoor fireplace gives homeowners the look and feel of a traditional fire, complete with crackling logs and natural-smelling smoke (which you can change based on the type of wood you burn). Because they use real wood, sparks and smoke will be part of each burning. Some communities restrict size, style and fuel type of outdoor fireplaces, so make sure you check local ordinances before you put yours in. Because an outdoor fireplace can use open fire, make sure you place it in a place free from trees and power lines. As a general safety rule, always keep a fire extinguisher or water source nearby. Considering an outdoor fireplace in your backyard? Contact us to find out more!